During the first days of 2011, I went to check the status of Internet Explorer 6 usage on http://gs.statcounter.com … and it’s good to see that this browser’s mindshare is constantly shrinking — between October and December 2010, it went from 3.1 to 2.3% in the US, and from 2.9 to 2.4% in Europe. It’s only in the African and Asian countries that IE6 still has a userbase higher than 10%. The statistics for Switzerland are even more enjoyable: between that last 3 months, IE6 usage dropped from 2.05 to 1.74%. With those numbers, I believe that web designers have a solid argument for ditching support of this 10-year-old software – unless the management decides that their Asian or African customers are deserving the extra time investment. How low must the usage share go, before it can be neglected? Under the 1% bar? Considering the benefits that HTML5 and CSS3 are bringing to modern browsers (notwithstanding that IE6 did not support CSS2 properly in the first place), we have an astounding number of reasons to drop IE6, even if its official end-of-life will occur in April 2014 (sigh) with Microsoft terminating its support for Windows XP. Not only is the extra effort for the shrinking 2% of users extremely time-consuming — since (a) there are no proper developer tools for this browser, and (b) it needs a dedicated/virtual machine to be actually able to run — but actually the worst aspect is that supporting it means holding back the last ten years of HTML/CSS improvement for the other 98% of web citizens. 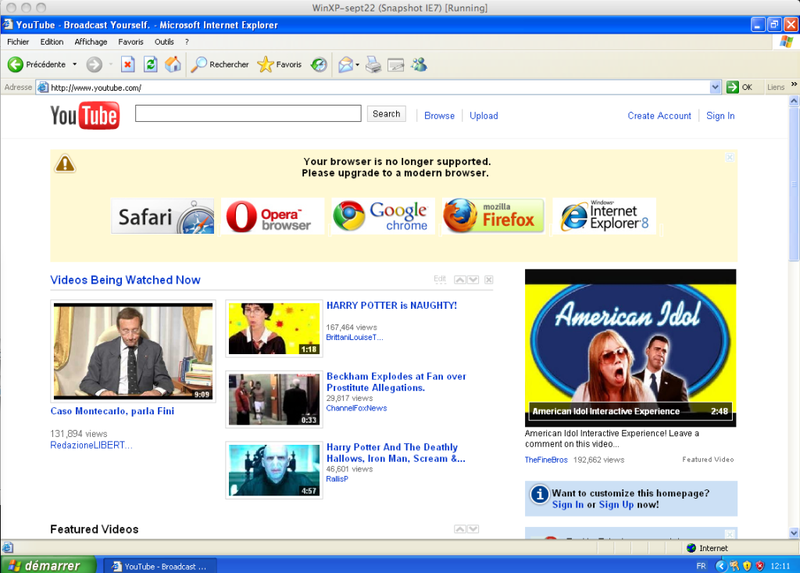 YouTube, a subsidiary of Google, is displaying to IE6 the canonical list of the five main modern browsers from www.browserchoice.eu. Note that in their list Safari comes first, Google Chrome is in the middle, IE8 comes last. UPDATE (2011-01-31): the list is actually randomized, which is a nice effort. UPDATE: (2017): in December 2014, browserchoice was discontinued (see Wikipedia). 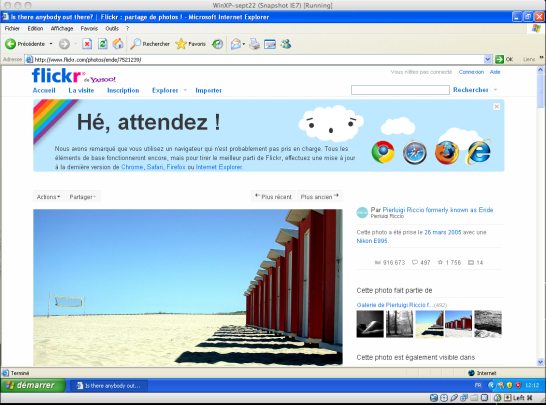 Flickr (a service owned by Yahoo) shows a similar-looking list, but ommits Opera. Chrome comes first, IE is in the last position. 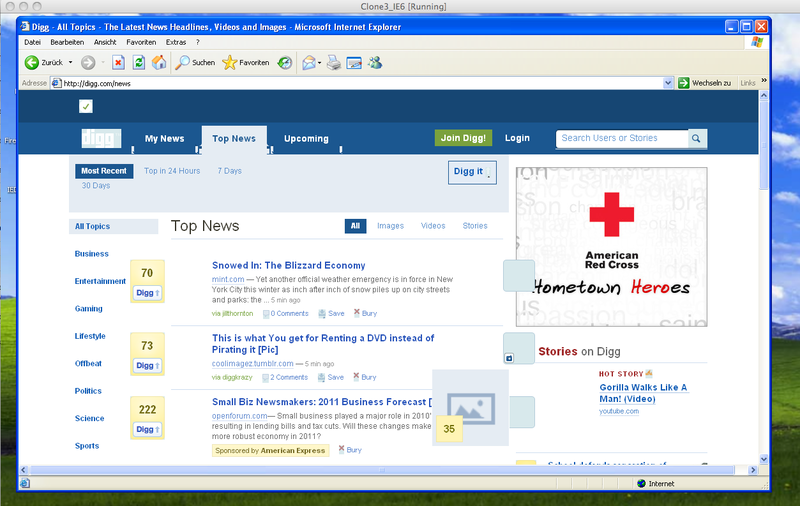 The designers attempted to accomodate the visual sensibility of the average IE6 user, employing a nostalgic 8-bit era color-stripe. Not sure what the sad cloud is referring to. 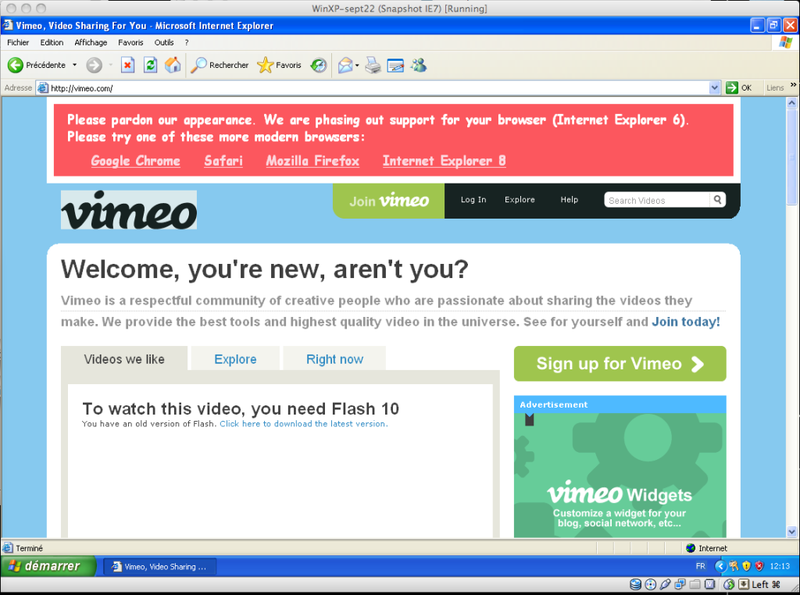 Vimeo takes a tongue-in-cheek approach, and doesn’t even care about fixing the transparent PNG of its main logo. The list here is in the same order as for Flickr, and poor Opera is missing again. Social news website Digg has chosen another route: as they explained it in their blog back in August 2009, they decided against a warning message targetting IE6 users, as they found that those users “don’t have the choice”. So rather than displaying a clear warning message, they quietly dropped their support. The result: their site actually looks even more broken under IE6 than the previous examples. Feel free to share your opinion on this topic, and don’t miss the next part in this series: Browser Wars in Europe: the Great East-West Divide. 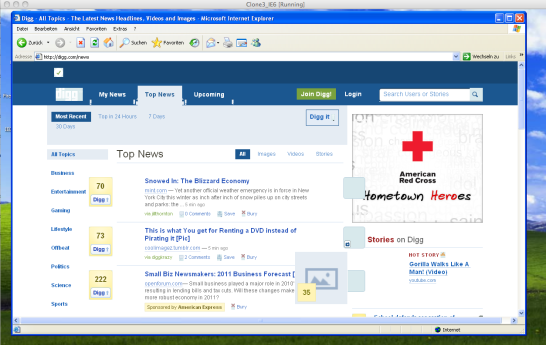 The Chinese are currently a huge part of the problem in regards to IE6. Many of them don’t actually use Microsoft’s IE6 but many use a rip-off of it called Tencent TT which uses the version of Trident that powered IE6 (although I think they’ve upgraded to IE7+ now). As to why the Chinese software developers would steal such a broken mess of a rendering engine and make it even worse is beyond belief, but that’s what happened. Thanks for the info, I wasn’t aware of this! Indeed the browser statistics for China are quite interesting. There’s another popular chinese browser called Maxthon, I’ve never heard of that either.